Founded in 2008, DecoWorks Pty Ltd aims to provide quality prop making services for theatre, display and promotional ventures and to produce a range of stylish decorative products for the home and garden landscaping. Our Creative Director, David Wilson, brings to the company his unique depth of theatrical experience gained from over twenty years work in the field of prop making. As well as having extensive prop making skills David spent fifteen years as head of the props manufacturing department at Australia's national opera company, Opera Australia. 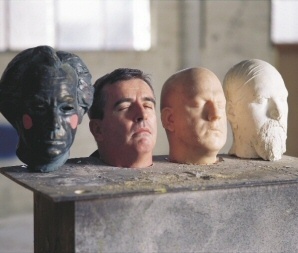 The photo (above left) was used in the December 2003 edition of Marconi Magazine which ran a small story about the Head of Props at Opera Australia. You can read the full text of the Marconi Magazine article along with which head belongs to what show. From 1993 to 2008, in collaboration with designers from both Australia and overseas, David and his team produced all the props and scenery dressing requirements for over 75 new Opera Australia productions. He was also responsible for the technical design and production of specialised theatrical props and effects used in many of these new productions. Our motto, "the Art of invention", encapsulates our vision of making distinctive products a reality for the discerning client. Creating inspired new designs and individual feature pieces that enhance existing décor is our passion. to fine workmanship, openness and fairness in delivering products and services that exceed expectation. that are tailored to add beauty and elegance to your home, display or presentation. our commitment to providing quality products and services to all our clients.